I love eggs. From my head down to my legs. And, also, my stomach. 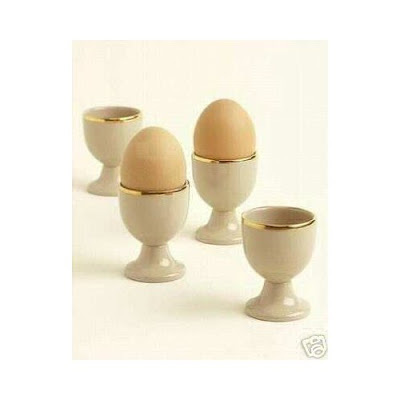 I like them every single way there is to cook them- poached, hard-boiled, scrambled, sunny-side-up, in an omelet, and soft-boiled in one of these cute little egg cups, which everyone should have. ("But, Lil, I don't have space for things that useless! ", you might be thinking, but actually, in addition to being cute and not taking up much space at all, they are quite useful, if you think outside the ovoid - ours double as salt cellars, mini bud-vases and shot glasses, since I got rid of most of our college-era drinking paraphernalia in our last move). But I digress. The only bad thing I can say about eggs is that I frequently buy them, and hard-boil a whole dozen of them to keep in my fridge for easy lunches or snacks (Did I mention I love eggs? It's kind of a miracle my cholesterol isn't at Lipitor levels), and then I buy more just because I'm at the grocery store, and before I know it, I have five dozen eggs in my fridge, and I can't remember which ones are cooked, which ones are raw, and which ones are old and stale (and if you've ever had an encounter with a truly rotten egg, it's not something you want to line up to do again- but even a moldy, stenchy shell full of slime couldn't deter my unwavering affection for eggs). Let's just say, I put all my eggs in one refrigerator. Here are two tricks I use all the time to tell my eggs apart. If you can't tell if an egg is fresh, put it in a bowl of water. A fresh egg will sink to the bottom. An egg that sort of stands up on one end, but stays underwater is still safe to eat, but if it bobs to the surface it's old and should be discarded (this is because eggs take on air as they age). It's the easiest way to tell which eggs came first. If you don't remember if an egg is hard-boiled or fresh, spin it on it's end on a flat surface. A fresh egg will wobble, because the yolk is moving around on the inside, while a boiled egg will spin smoothly, because the yolk is fixed. Use these tricks, and you'll never end up with egg on your face. Unless you want to.